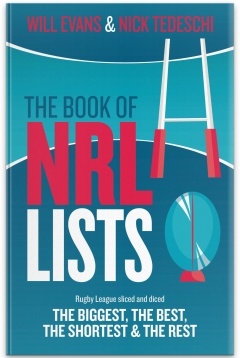 The Book of NRL Lists is a collection of lists and accompanying narrative, presented in a similar vein to The Slattery Media Group’s 2011 title The Book of Footy Lists by Mark Fine. It includes anything and everything Rugby League, with a focus on some of the more obscure aspects of the code as well as the standard “Best players for each club”, “Best players by position” etc. lists. The narrative style is light and fun, combining a quirky outlook with genuine passion for the game and its history and characters. Nick Tedeschi is a freelance rugby league writer and betting industry consultant. He has written extensively over the last six seasons on "The Greatest Game of All", penning words for Making the Nut, where he is editor-in-chief, and Punting Ace. Nick is also the editor of The Footy Almanac: Rugby League, the chief rugby league writer for Back Page Lead and can be found at RLeague, Betfair and Sportshub. Read an excerpt from 'The Book of NRL Lists', that appeared in The New Daily.